Girls bucket hats are cool. Girls bucket hats are versatile, affordable and comfortable. What's more, they are stylish enough that your little lady won't mind donning them everywhere from the beach and the pool to the park and the mall. Bucket hats have been around for nearly a century, but they didn't become a must-have fashion accessory until the late 1960s when a bumbling TV character named Gilligan habitually wore one on the hit comedy Gilligan's Island. The current fashion trend for girls grew when another popular TV character, Col. Henry Blake made his bucket hat, adorned with fly-fishing lures, an essential part of his wardrobe on the award-winning sitcom M*A*S*H.
Today, both adults and kids wear the soft cotton hats, which sport wide sloping brims. 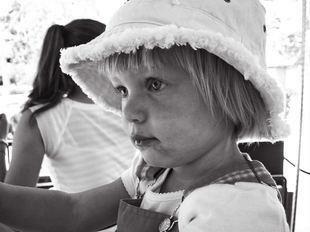 Parents especially appreciate the way the hat's large malleable brim offers shade for their children's eyes and face. Bucket hats are also popular because they are so easy to care for. The hats are typically made from heavy-duty cotton, denim or canvas and can be machine-washed. Girls especially love bucket hats for their versatility. Over the years bucket hats have gone from being boring solid colored cotton face shaders to cute, fashion forward headgear available in a variety of colors and patterns. While they still feature two metal eyelets, which are commonly placed on each side of the hat to provide added ventilation, girls bucket hats also include feminine touches, such as floral prints, ruffles and lace trim. Fortunately, girls bucket hats are not hard to find. They are readily available in most major department stores as well as specialty hat shops. However, in some parts of the world they are considered a seasonal item, and are only sold during the spring and summer months.